I love these alphabet letters. They came from my sister’s house but they are not an old family item. They must have been a part of my sister’s stock. She traded in collectibles. 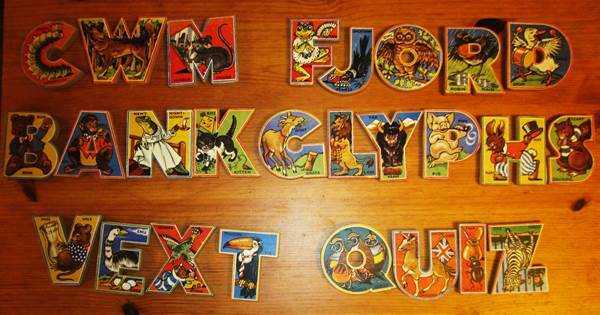 I have arranged the 26 letters to make a quite absurd pangram. That’s a sentence that contains all 26 letters of the alphabet. This one, which reads, ”Cwm fjord bank glyphs vext quiz”, uses each letter just once. It is rather quaint in its use of language but roughly translates as “Carved symbols in a mountain hollow on the bank of an inlet irritated an eccentric person”. Educationally I am led to believe they are all wrong. We don’t naturally write all in upper case letters and the sounds made by the words illustrated don’t always make the normal sound of the letter. 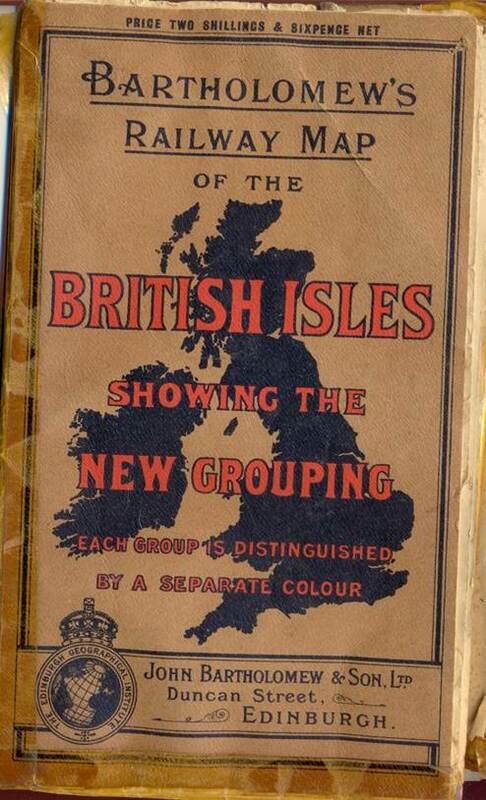 But who cares when the images are such fun. 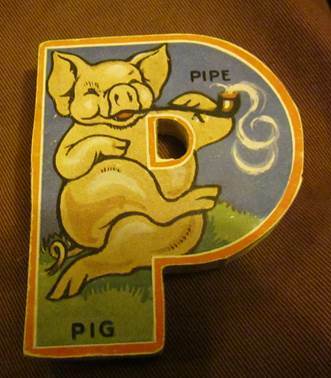 Here are some examples starting with a pipe smoking pig. 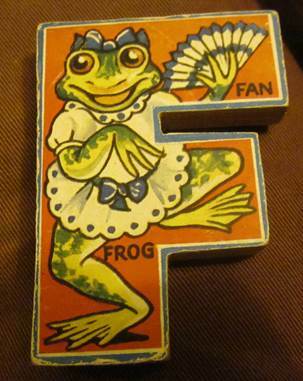 What a charming frog with a fan. Sadly I have no box, no maker’s name and no date. Maybe a kind reader could help. Do we all get more interested in wildlife as we get older? I’m not sure and I know I have always got a little thrill out of seeing interesting plants and animals. 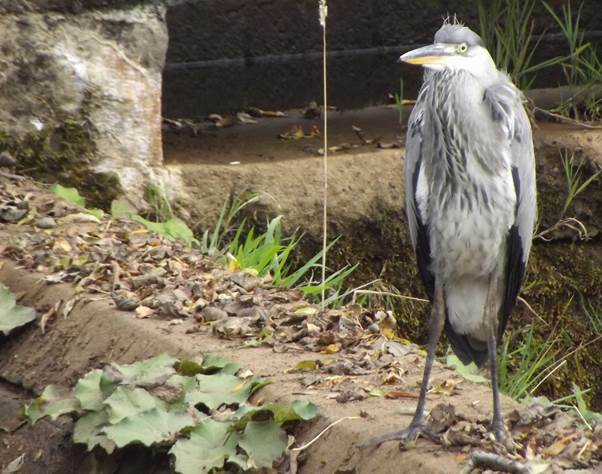 Herons (correctly grey herons) were not that common in my childhood and so they always created a little bit of excitement when seen. These days I seem to see them quite often but still get a buzz from seeing them and, if possible, grabbing a photo or two. Earlier this month we made our way along the Trough of Bowland in Lancashire. We had stopped for a wander when my wife thought she saw a heron fly over. Soon it buzzed right past us and settled but not in the best place for photography although my wife, using our old (20th century) camera with 1.3mpixel images, captured this one. 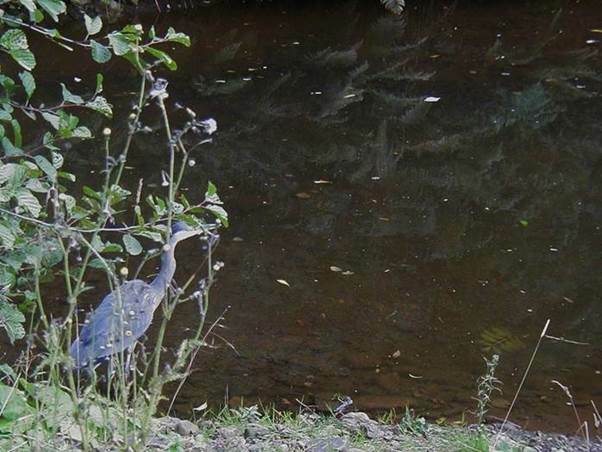 Heron decided we constituted a threat and made off to another location where he felt safe. I’m sure he was right, but he came well within range of my camera. Herons are such odd looking birds when on the ground. An annoying wall between me and him hid his feet. Time to hold camera above head height and shoot and hope. What a character! I love his little spiky hair do. He really is a grand chap (or girl for I can’t tell the difference). We stayed, for a week, in Dent which is in Cumbria but also in the Yorkshire Dales. That was earlier this month. We had some friends who lived not so far away in Lancashire and they came to see us so we took a walk which took in Dent itself and also Gawthrop, a neighbouring settlement. 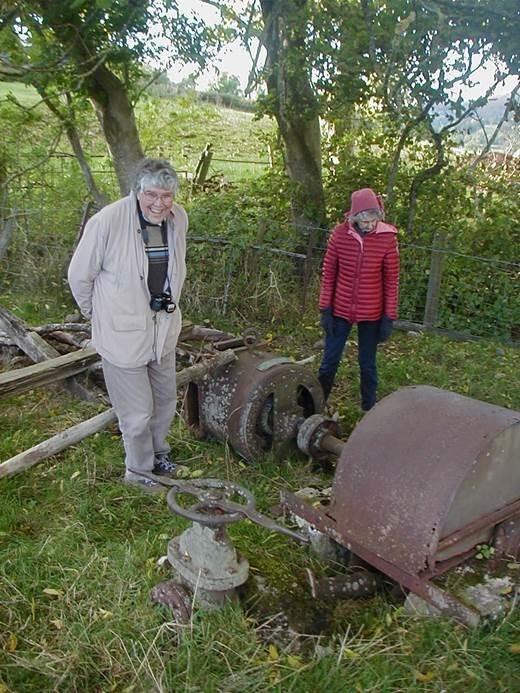 As we returned, down the hill from Gawthrop to Dent I came across a contraption on the hillside. To me it looked interesting to my friend it looked like a heap of junk. That’s me and friend’s wife examining this contraption. Well actually, it was more interesting than I imagined. It is a mini hydro-electric power station. The drum shape at this end had enough rust to let us peep in. It contained what I could describe as a water propeller. The hefty tap on the left could control the flow of water to this. At the far end of the shaft there is clearly a dynamo or generator for creating electrical energy from the flowing water. What a great bit of kit for this steep area, with many a potential flowing gill from which to gather the power. Even friend admitted it was interesting! 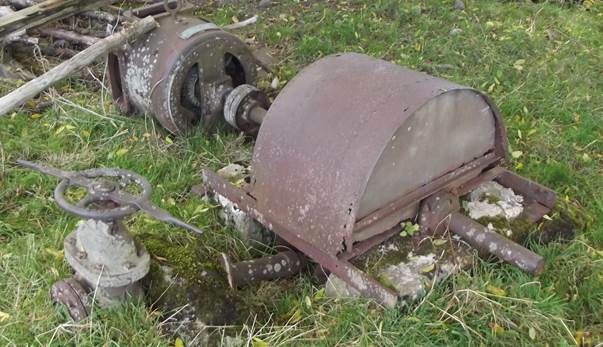 Of course, I’d love to know more about it – like how it came to be in a field and where it had been housed and used. From time to time boats I see take the eye. Normally these would have a canal connection or be sailing boats or barges. One such was the Amy Howson which I spotted in the Barton on Humber area in the autumn of 2006. Despite sitting on the mud I thought she looked truly lovely, but lighting and her position made photography difficult. This view was into the sun and so the boat looks dark. It was a better view from the other end. What a lovely vessel. You can type Amy Howson into Google these days and get a fantastic history of this sloop which dates from 1914. That means she has celebrated her centenary since I saw her. 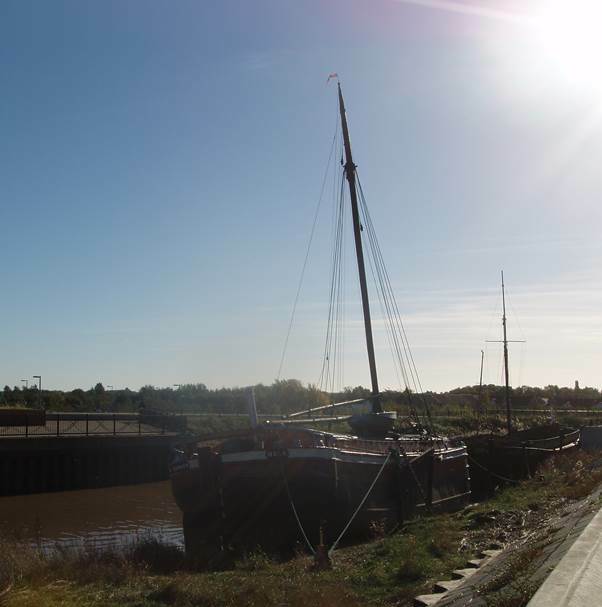 The site to visit is http://www.keelsandsloops.org.uk/humber-sloop-amy-howson/humber-sloop-origins.html . I really do suggest you visit that site. The boat has an amazing history of ownership changes sail changes, engine changes etc. There are dozens of photos on that web site, better than mine as well. 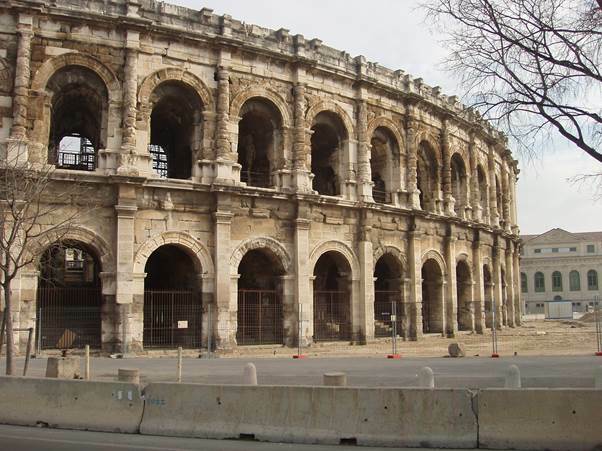 We have plenty of classy Roman remains in this country but the Arena at Nîmes is something a bit special. It is a Roman Amphitheatre rather like the Coliseum in Rome. 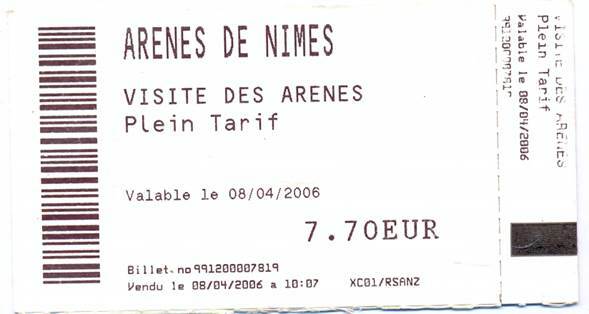 We were there in 2006 and of course I have a ticket. Not the most exciting ticket in the world so let’s look at some photos of the place. First of all from the outside. Ah yes! An area was being ‘redynamised’. Inside, it has new(ish) wooden seats. Performances are put on there. From the top you get views over Nîmes. What I couldn’t quite get was a view of the whole site. Well of course not as I was in it. I copied an aerial view from a postcard. That was a good visit – well worth the entrance price as seen on the ticket. I loved being a sheep keeper. The animals were friendly and trusting and seeing new lambs into the world always brought joy. But of course, there were moments of sadness too. This little chap was (I think) rejected by his mother and found it hard to do anything. 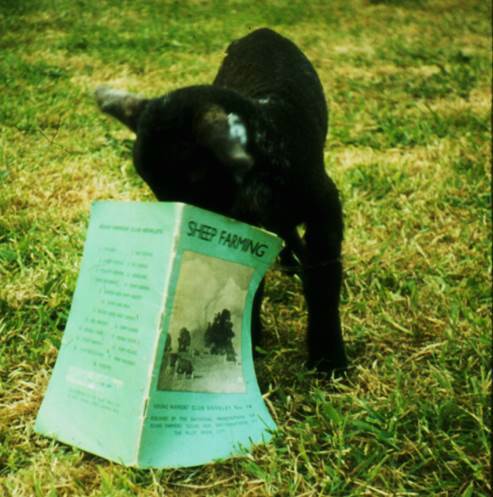 I turned to a vital book I had an NFU booklet on sheep and tried to find out how to help the little fellow. When I put the book down he came over and looked as though he wanted to read it. From memory, I don’t think this little lamb ever made it – a real moment of sadness but honestly, the joy brought by a success far outweighed the sense of failure if a lamb didn’t respond. I think the photo would have been more amusing if I could report a success, but sadly that wasn’t the case. It’s still quite amusing though. I feel sure this photo should be used for a caption competition. Just what are this group of people thinking or saying? I ought to know for I’m the youthful looking chap in cheap green wellies but I have entirely forgotten the occasion. Having said that, there’s enough location there for me to know that it is part of my ‘land’ and therefore my hole. 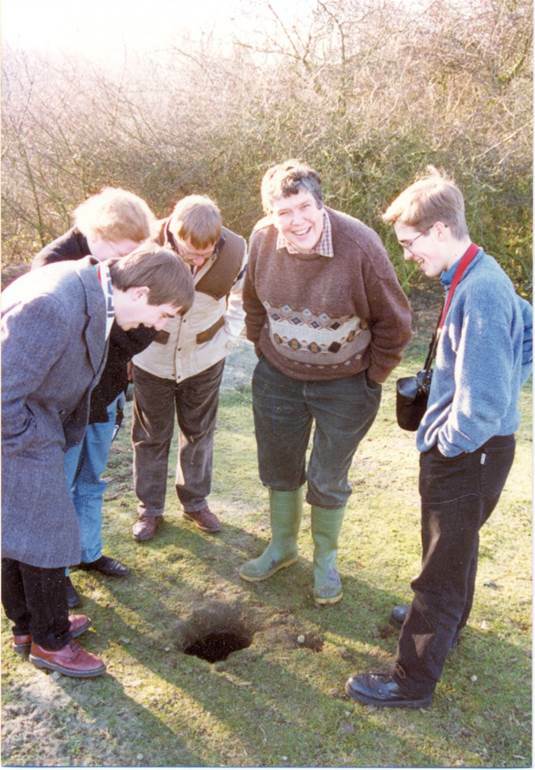 The real cause of it, I’m sure, is badgers but possibly they just tunnelled too near the surface and a bit fell in. It isn’t the entrance to a badger sett which would feature a huge mound of soil dug out by those black and white home builders. The other people in the photo are members of my family and from ages I’m guessing this was in the late 1990s. On the left is a nephew with his wife behind him. Next is my brother in law and then me and it’s my son on the right. My sister must have taken the photo. Much has happened in the 20 or so years since that photo was taken. My nephew is now a niece and his wife has stayed with her. They have a 15 year old daughter. My brother in law has developed a horrible, frontal lobe dementia and is more or less bed ridden in a care home. My son is married and a dad himself these days. I just look older and my current pair of wellies are black. I always buy cheap wellies. Expensive ones are just as prone to putting a fork through them or splitting where they crease as you walk. And of course, my sister, who took this photo, died last year which is why this photo has recently come to me. We married and set up home in 1971. Ladderax was a popular style of furniture at the time. It consisted of ‘ladder’ on which you could fit a variety of shelves and cupboards and arrange them as you wanted. I think we’d have liked some back in those early 1970s but frankly we couldn’t afford it. It was just that bit more than we could justify. However, a liking for the style has persisted and recently we decided to make better space of a wall in our entrance hall by getting a mix of storage and display furniture. But we had a problem in that the presence of doors limited us to a depth of furniture of 14 inches. Anything deeper than that would foul doors. We searched in vain for something that suited us. Well, it was in vain apart from Ladderax itself, now available only (as far as we found) on the second hand market. A four ladder system was going to suit us with some of the shelves/cupboards two feet wide and some three feet. We found what we were looking for on eBay. 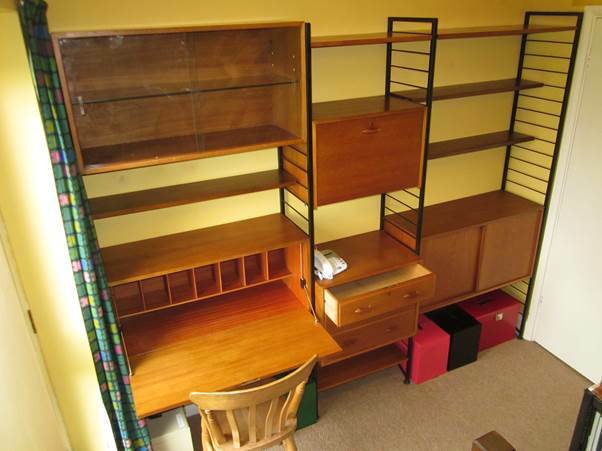 Actually, it was a five ladder set up so we have a spare but we have still used all of the cupboards and shelves we bought. 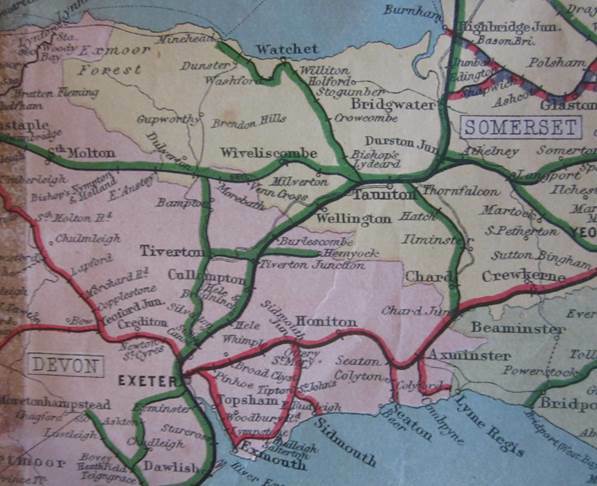 It was, of course, a ‘buyer collect’ item and it was about 140 miles from our home. We hired a van big enough to take all of the cupboards and also the two metre long ladders and set out on quite a lengthy day trip. We’d have liked to have had more time but can I say that Uppingham in Rutland where we purchased our furniture is a lovely little market town and just down the road, Rockingham is a delightful estate village. Our Ladderax is now assembled and looks like this. It’s in amazing condition for something more than 40 years old. You can see in the photo that the end ladder reaches across to the architrave around a door. We just couldn’t have gone wider. By the way, the edge on curtain which you can see has been in use by us in more than one house since the early 70s, so it all fits together in style and period. 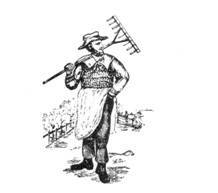 This particular piece is written by Edward Slow who wrote in the Wiltshire dialect. This one, about the Harvest Home celebrations was written to be sung. We’ll keep our harvust wom. Ta liven up tha zene. Var Hirl ar var Squire. Let love an vrenship on thease day, &c.
Till ther eyes begin ta blink.